Various activities, meetings and interviews held during first week of Germany tour. With the Grace of Allah, the visit of the World Head of the Ahmadiyya Muslim Community, the Fifth Khalifa, His Holiness, Hazrat Mirza Masroor Ahmad to Germany has now entered its second week. During the course of the first week, His Holiness opened new Mosques in Aachen and Hanau. He also inaugurated the Baitul Aafiyyat building that shall serve as the headquarters of Majlis Ansarullah Germany and Lajna Imaillah Germany. Hazrat Mirza Masroor Ahmad has personally met thousands of Ahmadi Muslims and presided over the Aameen ceremonies of hundreds of children. His Holiness also held a special meeting with a range of German professors and academics during which he explained in detail the true teachings of Islam and answered various questions. Over the course of the weekend (30-31 May), His Holiness held educational classes with Ahmadi Muslim youths living in Germany at the Baitus Subuh Mosque in Frankfurt. On Saturday, His Holiness held two classes with University students, whilst on Sunday he held two classes with members of the Waqf-e-Nau scheme. During the university classes, Ahmadi Muslim students presented their academic research, followed by question and answer sessions. Thereafter, the students had the opportunity to ask His Holiness questions. In the Waqf-e-Nau classes, the Ahmadi Muslim children were also able to ask His Holiness questions on a range of topics. Hazrat Mirza Masroor Ahmad has travelled to Germany to attend the 40th Jalsa Salana Germany (Annual Convention) taking place in Karlsruhe. The 3-day event is due to take place from 5-7 June. It is expected that around 30,000 people from dozens of countries will attend the Jalsa Salana. 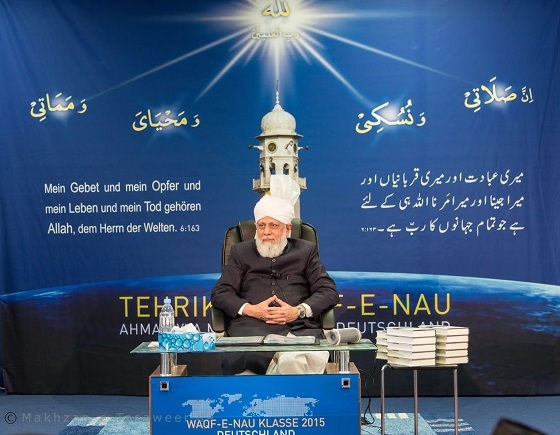 Share the post "Visit of Head of Ahmadiyya Muslim Community to Germany enters second week‏"